What is that, a cloud? The satellites that send us data are travelling 500 miles above Earth. These satellites cannot see through clouds, so when there is a cloud above the earth, the satellite senses the temperature of the cloud and not the earth below it. Clouds are high up in the sky and are almost always cooler than the earth below. The farther you go up in altitude, the cooler it gets. Just ask a mountain climber. So, knowing that clouds are cool, look at the image below (figure 2). The white areas are definitely clouds. They are so cold that they are off the temperature scale. Meanwhile, the ocean around them is green and yellow and orange. If you see an image with a straight line that divides the sea surface temperatures from a white area, this is the edge of the area that the satellite was capturing information. Compare the left-side image in figure 2 to the one on the right-side. Clouds aren’t usually super straight! Unless something very strange is going on, white areas in our imagery are RARELY water. Figure 3 has a couple more examples of what we might see. In many of the images you will notice dark pink areas, marked A. These are cloudy areas that were not cold enough to be eliminated by the computer. The location, shape, and surrounding temperatures can help you tell them apart from very cold water. Sometimes the cloud cover doesn’t completely hide the sea tempertures below them, it just makes some areas look a bit cooler, like the area marked B. 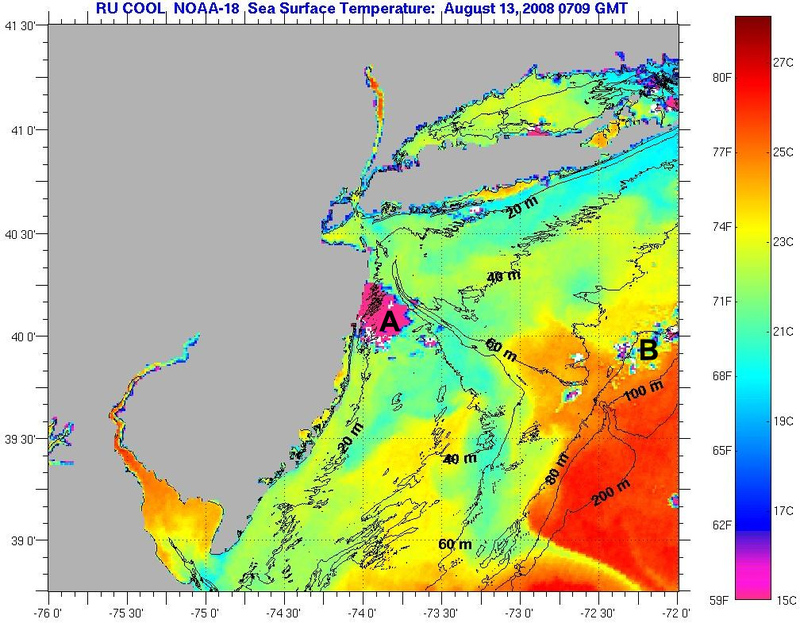 In these cases you might see some things don’t make sense as sea surface temperatures. There is another way to help identify clouds if you’re still not sure. Clouds move rapidly over the earth at speeds between 15 to 50 mph. Water currents move at less than 3 mph. So, the temperature patterns in the ocean should not change quickly. If you can compare two images that are less than 24 hours apart, you will know if a pattern is a cloud because it will not be in one of the two images. THE TEMPERATURE EXCEPTION- Upwelling – Sometimes during the summer, water from the ocean floor rises quickly from the bottom and can cool water temperatures 15 degrees in one day. The two images below (figure 4) show one such upwelling event. They are only 22 hours apart, but the coastal water temperature dropped 10 degrees! In our area, these upwellings only occur along the coast. Find out more about upwelling. So… how do you know the difference between all these things? Practice! As you see more and more images, you will learn to recognize the differences. Is the temperature in the right location? One important thing to know is that the satellites we use to get sea surface temperatures are 500 miles up in space and moving at speeds of around 20,000 mph. Now that’s fast! The SST images are auto-navigated using the predicted satellite position but… because of this excessive speed and some tilt and roll in the satellite, sometimes the image isn’t exactly in the right spot. How will you know that? Take a careful look at the image in figure 5. This SST image is not quite right. If you look point A, you will see the coastline in the Cape May area. Now look carefully at the image itself. Notice the gap that follows the coastline. The coastline is the same shape as the temperature data, but doesn’t match up. 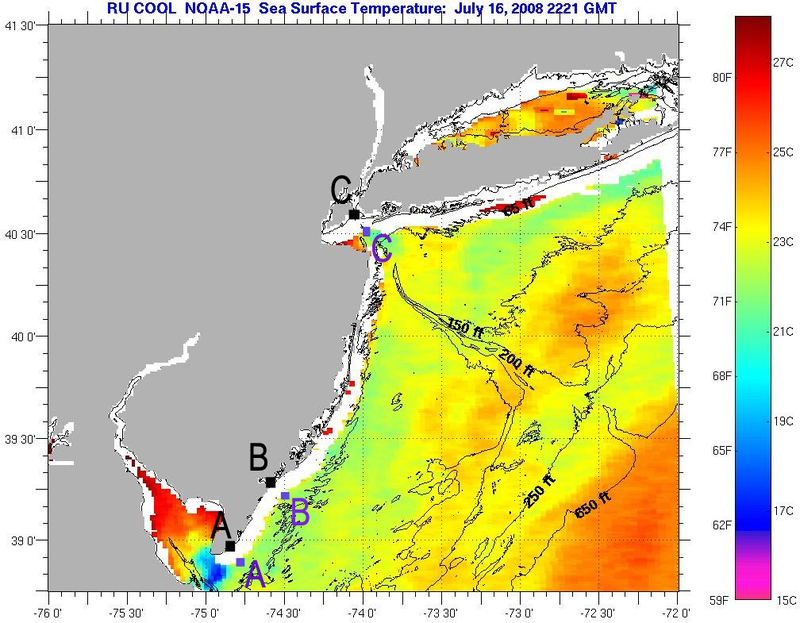 You can see that the coastline near points A, B, and C should be matched up with the same points on the sea surface temps. The algorithms that line the satellite imagery up with the land are pretty darn good, but exact navigation all the time requires human intervention. As a web site user, you can’t move the coast, but you can now estimate how much error there is in the image navigation when planning your boat trip. Well, we aren’t biologists here. In fact, most of us don’t fish at all. But, many of the people who have used our web site over the years are fishermen and fishing boat captains. Everything we are about to tell you, is based on what we have learned from them. Thank you to the sea-goers who use our site! On any day of the year, plenty of algae are floating on the ocean surface. These plants are food for small fish. The small fish are food for medium size fish. Finally, the medium fish are food for the big boys (Tuna, Mahimahi, etc). So, if you think about it, generally speaking, wherever there’s a lot of seaweed at the surface, you will probably find some sort of big fish down below. The tough part is finding these seaweed lines. When you see huge temperature differences in an image, there are usually surface currents pushing toward each other in an area we call a convergence zone. The surface water, and everything in it, pushes together. When two water masses push towards one another, it’s kind of like two conveyor belts facing each other (figure 6). But seaweed and algae float so they begin to pile up at the surface in large lines. Got it? The bottom line: Temperature fronts generally equal some fish. 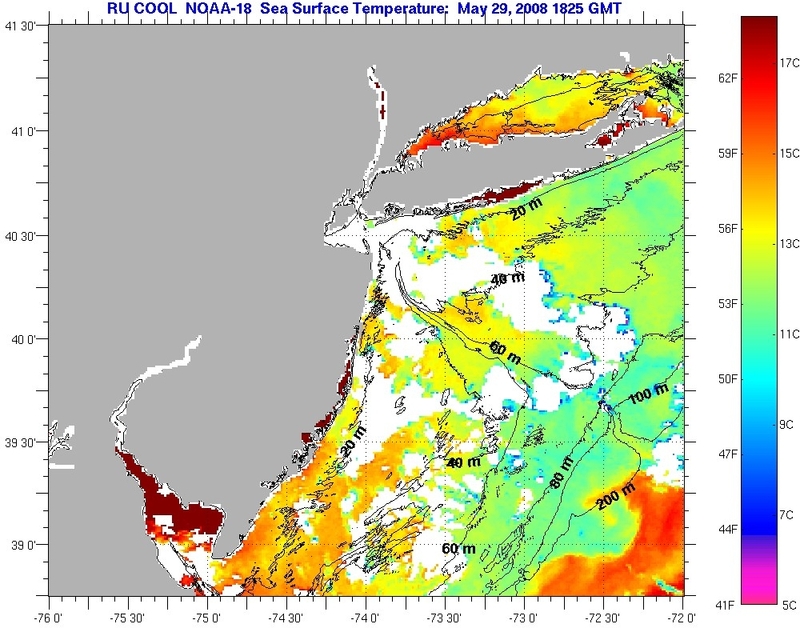 All of our Sea Surface Temperature (SST) images come from NOAA/AVHRR satellites which you can learn more about by clicking here .